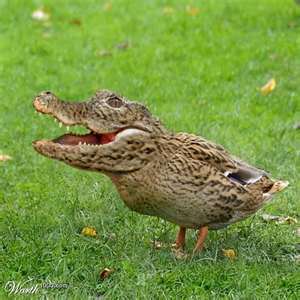 Since the late 19th century, it has been accepted by palaeontologists, and celebrated in lay reference works, as being the oldest known bird, though a study in 2011 has cast doubt on this assessment, suggesting instead that it is a non-avialan dinosaur closely related to the origin of birds. Tetrapod footprints found in Poland and reported in Nature in January 2010 were “securely dated” at 10 million years older than the oldest known elpistostegids (of which Tiktaalik is an example), implying that animals like Tiktaalik, possessing features that evolved around 400 million years ago, were “late-surviving relics rather than direct transitional forms, and they highlight just how little we know of the earliest history of land vertebrates”. Wikipedia points out that, just as in Darwin’s time, the incompleteness of the fossil record is the bugbear. I’m going to suggest that Darwin’s optimism that time would change that picture has proven misguided. First though, one must point out that transitional forms are a necessary feature of all nested heirarchies, and that nested heirarchies existed in biology long before any concept of evolution. So, had the okapi from my previous post been discovered in Linné’s time, he’d have considered it, just as we do, as a more moderate kind of giraffe tending towards more typical ungulates. The fossil chronology is what gives transitionals all their significance as evidence in evolution: if a morphological intermediate is also chronologically intermediate, it is likely to be in, or near, genealogical succession too – which is why Tiktalik has Wikiproblems from being out of sequence. But to attribute meaning to such evidence one has to know that the fossil record is more or less reliable. For example, a really sparse fossil record might show a false chronological sequence between three taxa actually created miraculously at the same time. This (the misleading fossil record I mean, not the supernaturalism) is not as implausible as it seems. A critic of the quality of the vertebrate fossil record might have expected more surprises. Recall that Charles Lyell, a supporter of the idea that time proceeded in cycles, and an opponent of the idea of progression, or unidirectional change through time, quite expected in the 1830s that human fossils might be found in the Silurian. He campaigned hard in the 1850s to convince colleagues that new discoveries of Silurian arthropod tracks from North America had actually been made by land vertebrates. So to Darwin’s geological mentor, a pre-cambrian rabbit would have been disappointingly mundane… incidentally, as an exercise, can you say what in Neodarwinian theory precludes a cyclical, rather than linear and branching, evolutionary process? I’ll return to Benton in a minute. Before I do, I must add that, given the limited evolutionary significance of nested heirarchies, one needs a lot more from the fossil-record than a few intermediate forms to evidence particular models of transformism, such as Darwinian gradualism, punctuated equilibria, saltation or even progressive creation. Of these the first, as Darwin saw, is the most difficult to demonstrate, because proving gradualism requires that one find a succession of closely-graded changes between similar organisms. If Donald Prothero’s estimate that our 250,000 or so fossil species represent only 1% or less of those that have lived, the finding of such a sequence is vanishingly unlikely without logarithmically more discoveries than we have made so far. What would also have confirmed gradualism would have been an emerging pattern of taxonomic plasticity – finding two examples of the same species should be rare, but it’s the norm to find many. 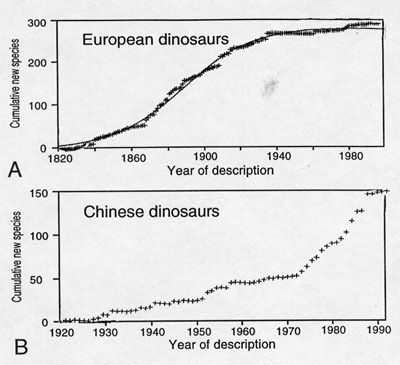 The fossil record, then, must either be extremely unrepresentative, or true gradualism false. The overall pattern of diversification, and the timing and magnitudes of major extinction events, were unchanged. Maxwell and Benton (1990) concluded that all the changes in understanding of the tetrapod fossil record in the past 100 years had not altered the broad-scale macroevolutionary patterns derived from it. These findings have been confirmed for marine animals in an analogous study by Sepkoski (1993). As to the completeness of the record, he offers three quantitative approaches. So good estimates can be made of the richness of life based on good records dating back to the Cambrian, which also shows that time does not necessarily irretrievably degrade the record. The phylogenetic congruence assessments have indicated that there is no evidence that vertebrates have a fossil record that is either any better, or indeed any worse, than that of any other major group of animals. In addition, there is no evidence that the record of continental (that is, terrestrial and freshwater) tetrapods is worse than that of marine echinoderms or fishes. Comparing continental and marine habitats. Benton and Simms (1995) obtained some counter-intuitive results when they showed that continental tetrapods have a fossil record that is as good as, or better than, that of echinoderms, based on comparisons of results obtained with the SRC and RCI metrics. This shocking result could not have been predicted from observations of the field occurrence of both groups: tetrapods are found in sporadic and unpredictable sedimentary settings, while echinoderm remains are hugely abundant in many marine shelf deposits. One can see that in the old European collecting grounds, the graph is near saturation, whereas in the less-studied Chinese beds, there is still a steep curve, with a levelling of uncertain significance only in the last decade or two. 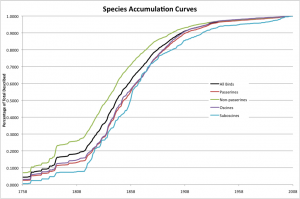 It is fair, though, to predict that some time in this century the Chinese graph will match the European, and that other areas will follow suit (presumably Antarctica being the last to yield its unique species). It is statistically valid to quantify effort against discovery rate, and to assert that the longer some unknown organism remains undiscovered the less likelihood there is of its former existence. That seems to me slightly contentious, in the sense that if the fossil record is only a tiny fraction of those species that lived, what remains is a fairly random sample. If Darwinian gradualism is the case, that must be the case, or transitions would be the normal finding, not the exception. 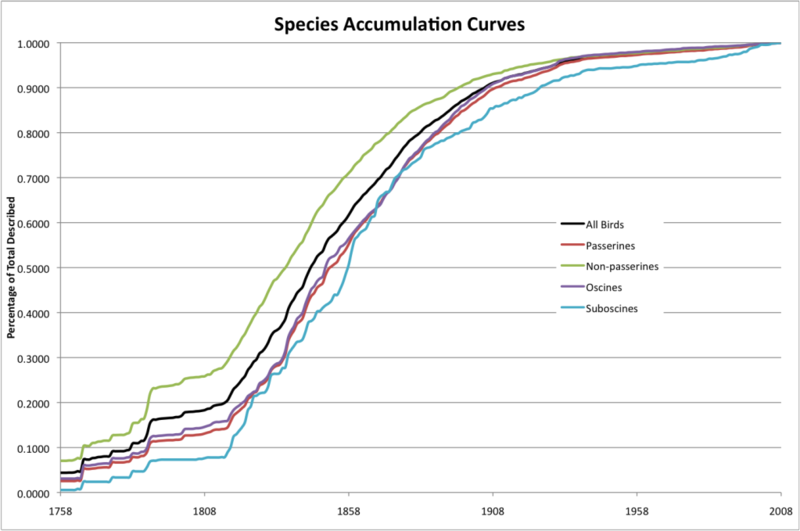 It would be more accurate to say simply that the “collector curve” demonstrates that there is less and less likelihood of missing species ever having been fossilized. That, it seems to me, leads to a dilemma which has all the signs of being insoluble. For either we can be pretty certain that the kind of transitions that would confirm gradualism will never, ever, be found; or we can be pretty certain that they never existed in the first place. Either way, the fossil record is never going to support Darwinian gradualism. There’s one conceivable exception, which is that amongst the “massive number of transitional species growing with each passing year” (! ), apart from any that will impress Wikipedia enough to update their article, there will at some point emerge an absolutely golden sequence of transitions (in successive sandstone layers) between two closely-related taxa. Not only would that show that Darwinian gradualism has actually ocurred, but it would also prove that the fossil record is far more complete than anybody realised – and therefore that gradualist transitions are excessively rare, and saltations the norm.